IF you'll be in the United States or Canada in November of this year and have a few spare days up your sleeve, think about ducking down to the Caribbean and treating yourself to your best Christmas present ever – five days onboard the world's highest-rated boutique motor cruiser, SeaDream I at just a touch over one-third of the brochured price. 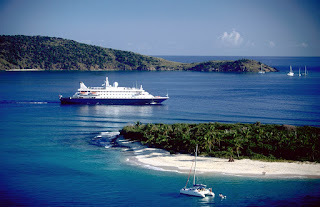 Beginning now from only US$2,279pp twin share compared with the brochured US$7,180pp lowest price, you'll sail from Marigot on St Martin in the French West Indies on November 20th, have an overnight onboard in Gustavia also in the FWI, and then enjoy balmy Caribbean days ashore at Sandy Ground in the British West Indies, South Friars Bay on St Kitts, Charlestown on Nevis, and back to Marigot. With no more than 110 other guests indulged 5-star by 95 officers and crew, your hugely discounted price will include SeaDream's award-winning cuisine, premium wines, spirits and other drinks with meals and at the no-charge bars, power and sail water-sports, use of the golf simulator and fitness centre, port charges and taxes, and even staff and crew gratuities. ADDITIONAL PORT INFORMATION: MARIGOT is possibly the most French in spirit of all cities in the French West Indies, with colonial homes sitting side-by-side with cafés, bistros, pastry shops and boutiques that offer the latest in European designer fashions and jewellery – and better still, at both duty- and tax-free prices. GUSTAVIA is perhaps SeaDream's "most treasured" destinations in the Caribbean, with exceptional beaches, restaurants, shopping and places to explore with SeaDream's free onboard loan bikes. SANDY GROUND is the place to swim with the dolphins or bike ride around the island, while SOUTH FRIAR'S BAY offers swimming, snorkelling, body surfing or breasting the many beach bars and restaurants. CHARLESTOWN is a favourite with regular SeaDreamers with its land tours and restaurants and bars. 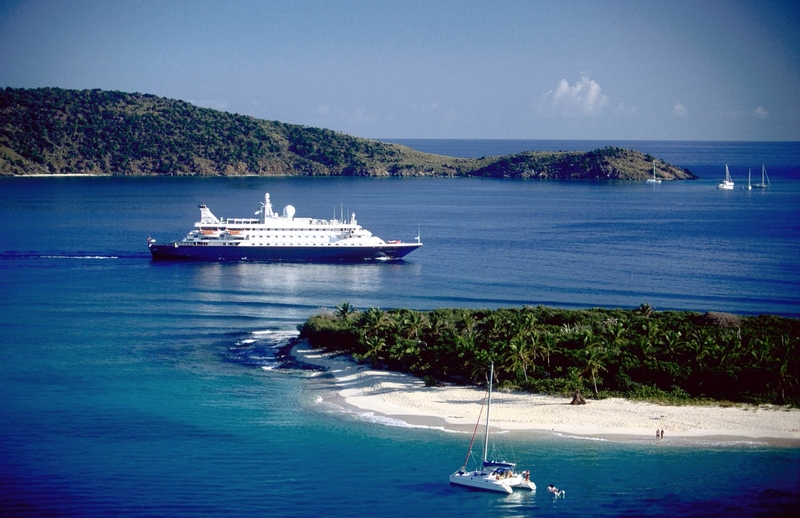 SEADREAM slips through the idyllic islands of the Caribbean.